Quel bonheur pour l'espece humaine! Croit le rappeler à la vie. This etching by the Genevan artist Jean Étienne Liotard, dating from 1731, is a copy of a lost painting by Watteau. It was one of the many engravings prepared for the posthumous Recueil Jullienne. 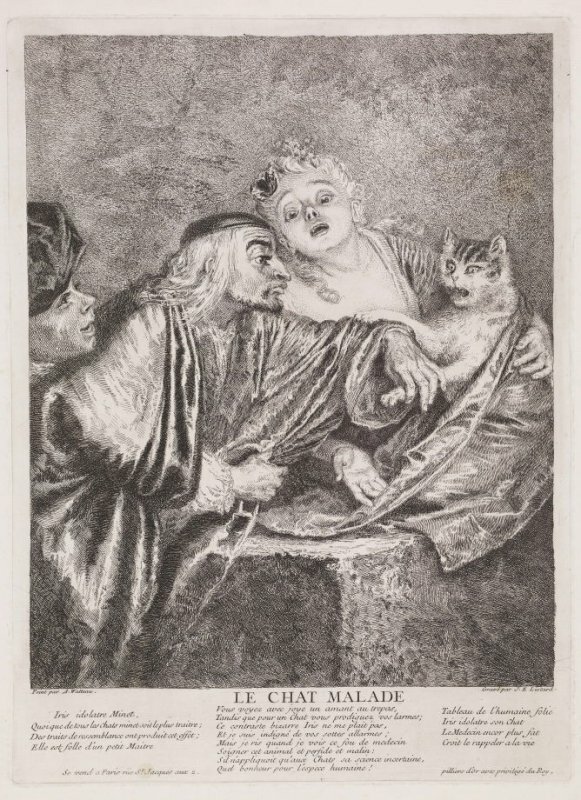 The Goncourt brothers characterised it as "one of those rare engravings that catch one's attention and retain it - that intrigues one's thoughts!" The satirical subject is unusual for Watteau, but no explanation seems to survive as to why he painted it. The picture depicts a doctor, a skinny figure with long greasy white hair, draped in a long gown, solemnly feeling the pulse of a cat, which is wrapped up in a bedcover and clutched to the bosom of its concerned owner. The cat is spitting and ready to scratch the illustrious member of the Medical Faculty whilst the girl looks on with alarmed attention. In one corner a third figure, probably a valet, watches with curiosity. The verses at the bottom proclaim the theme of human folly. We learn that fondness for the cat is misplaced, for this feline is both "perfide" and "malin"; the doctor who applies his uncertain science to curing it, is simply a fool. I can't find a source for the verse - perhaps it is an original. Minet is a generic French name for a pet cat. A 19th-century article in Le Magasin pittoresque reproduces the etching and recounts at length the story of Iris and her beloved Minet; but there are no sources given, so probably this is just a imaginative excursion. "Le chat malade", Le Magasin pittoresque /edited by Édouard Charton, vol.xxv January 1857, p.25-6. The Louvre holds a sanguine drawing by Watteau of a head, three hand and two little cats which may possibly be preparatory sketches for the painting. The etching itself is quite common and there are copies in various public collections. 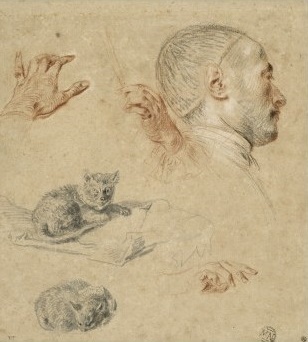 Watteau, Studies of a man’s head, hands, and a cat. Red, black, and white chalk, graphite, 20 x 18.1 cm.